Quotes can be sent to a Lead or Customer for approval. The Customer can approve the Quote online. Open a Lead or Customer and choose the "Quote" submenu. Click Add New and fill in the Quote details. Click the Email button to send the Quote for approval. 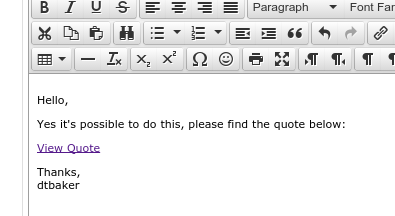 When the Customer approves the quote an email will be sent to the assigned Quote staff member (to change this email edit the quote_approved_email template). Once the Quote is approved a new button will appear on the Quote page saying "Convert Quote to Job". This will convert the Quote into a Job where you can tick the tasks off as they are completed, then finally generate an Invoices from the Job.